A short distance from the Peak is Pinecrest Overlook. Here you will find sweeping views of the Dardanelles and various peaks beyond. Looking toward the south you will see the path of the Stanislaus River, several ski runs (Chair 8) at Dodge Ridge Ski Area as well as the Marina at Pinecrest Lake (well below the Lookout). You will also find the foundation of what used to be an observation lookout built during World War II. 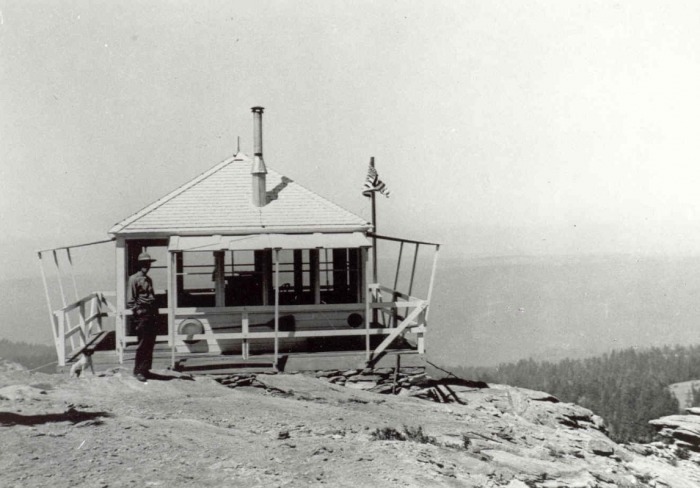 After the war, It was used as a fire lookout until 1973. Ironically, it was destroyed by fire. The photo to the right was taken in 1935 by Ola Zimmerman and is a part of the Stanislaus National Forest Collection. The elevation of Pinecrest Peak is 8025 feet and is reached by Highway 108, (past the Summit Ranger Station) then turn right onto 4N12. Follow this Road for 2.7 miles to Road 5N31. Turn south and continue to the end where you are at the top of Pinecrest Peak. A 4WD vehicle is necessary on 5N31. Park off the road to investigate the Peak and find the Survey Monument. Not all peaks have these markers…only the more well-known ones.